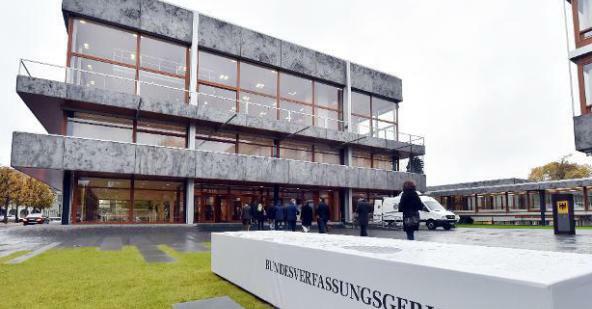 According to a tweet by journalist Hendrik Wieduwilt, the German Constitutional Court has asked the German legislator not to put implementing legislation for the Unified Patent Court and Unitary Patent into force. More to be reported in tomorrow's FAZ (Frankfurter Allgemeine Zeitung). Apparently, in the meantime the information has been confirmed by the spokesperson for the Bundesverfassungsgericht. Needless to say, this is a bombshell. According to the Legal Tribune Online, the request by the Court is due to a constitutional complaint by an unnamed private person. IPKat will keep you posted on further developments. UPDATE 13 June 2017, 7:35 GMT: The FAZ article mentioned above has been published. According to the article, the Constitutional Court asked the German President on 3April 2017 first orally, then in writing, not to sign off on the implementing legislation for the Unitary Patent Package. This is rather unusual. The court apparently considers the complaint (2 BvR 739/17) not wholly without merit ("nicht von vorneherein aussichtslos"). It is still unknown who the complainant is. Given the docket number from 2017, this is not one of the Mundipharma complaints which have been pending for a while. Our understanding is that this is an agreement by the Office of the President to suspend ratification pending the Court's determination of the issue in the ongoing expedited proceedings before it. The Court has not yet reached a decision. This is correct. In no way has the Court expressed an opinion on the merits of the case. It is a preliminary measure. May you please clarify to which "issue in the ongoing expedited proceedings before it" are you referting to exactly? In the United States, there have been numerous attempts to reconstitute the Ninth Circuit Court of Appeals, and all of them have failed. In fact, the politicians who make the effort to redraw the 9th Circuit's boundaries inevitably end up badly embarrassed by professional or personal scandals. Some go so far as to joke that there is a curse of the 9th Circuit. I am beginning to wonder if the UPC is not similarly cursed. First BREXIT, now this. It is as if the universe does not want a pan-European patent court. Are the British now blocking Germany from being true Europeans? Even if it is a provisional measure, the mere fact that the German constitutional Court stops the ratification process, shows that the objections raised by the "unnamed private person" must have some value. In the contrary, the Constitutional Court might not have gone so far. We still have to wait whether the court will accept the petition, and in the affirmative, what the decision as to the merits will be, but the time table for starting the UPC is in tatters. There is no uncertainty about this. There are further constitutional claims pending before it, but at the moment it is not clear if they are related to the present case, although they might touch upon a similar topic. In a lecture before the MPI at the end of May, the former constitutional judge Prof. Broß expressed reservations about the constitutionality of the EPO and hence the UPC. Some of the arguments brought forward cannot be simply wiped away and ignored, although some people would like to do so. We leave in interesting times! Sorry for the mishap: please read "We live in interesting times" and not "We leave in interesting times". Some details from tomorrow's FAZ article: Office of the President confirmed it has "suspended" its pre-certification review of the German consent act to the unified patent court, at the request of the Constitutional Court (case 2 BvR 739/17). According to the Office of the President, the Court considers the constitutional complaint "not, at the outset, without prospect" ("nicht von vornherein aussichtslos"). While the complaint as well as a "parallel" emergency petition concerned the law governing the patent court, patent reform as a whole is also on hold, being "materially interlinked", according to the Office of the President. FAZ hasn't learned how long the procedure is set to be on hold, and what exactly the reason is. Any more infos about this case "BvR 739/17"? Search engines are pretty silent? "17" means it was filed this year? I think the reason could be more trivial: transfer of sovereignty requires a 2/3 majority of the members of the Bundestag and Bundesrat, which was not the case when the Bundestag took a vote during nighttime. Does anyone know how long it will be before we get a ruling? If the timing slips further we run the risk of Brexit having happened before the UPC opens its doors. Any Brits enjoying the schadenfreude of Germany delaying the UPC should remember that the Queens Speech setting out the UK government's legislative programme has apparently been delayed because of the necessity to write it out on goat skin and the fact that the ink takes many days to dry on that surface. Ah. The speech is not written on goat skin. It is written on a high-quality archival paper, guaranteed to last 500 years (although I'm not sure who you should complain to in 2517 if it has disintegrated). The paper is known as goatskin paper, but is not actually made of goat skin. Assuming that the 500-year guarantee is evidence-based, I wonder if this is a very early example of a non-descriptive trade mark? @Ben: What makes you so sure it requires a two third majority? Art. 24 Grundgesetz seems to give the Bundestag the right to do this via a simple law. What was the fraction needed when the EPC and its amendment were ratified? If the fraction was indeed 2/3 then this might be the reason for the stop. On the other hand, it seems so flabbergasting to think that all legal advisers in the government have missed such a simple point. It's unlikely that the BvG is delaying ratification at this stage on a whim or that there has been some trifling error in the lower legislative process. Although the intervention is on an "Interim" basis, it is very rare that such a measure is granted at this legislative stage in Germany. A slow-burning issue over here, ever since BB's attempted dismissal of the BoA member, is that the theoretical deficiency in the EPC's "simulated" separation of powers under A23 EPC (tolerable, perhaps, under the German constitution) has now manifested itself in practice (not tolerable) through BB's actions. The executive (BB) has actually interfered with Judicial Independence in practice. The so-called "reforms" of the BoA structure are no more than a fig-leaf and might well make the situation worse. The AC has shown itself not capable of bringing BB to heel. Of course, this might affect the justiciability under the Grundgesetz not just of proposed unitary patents, but existing of pending EP(DE)s.
What I meant to say was that I can imagine the pending case that the Constitutional Court refers to is complaint due to the lack of a 2/3 majority of the members according to Article 23 GG in connection with Article 79 GG. I am not an expert on the German Constitution and I would not dare to guess if such a complaint would be successful. However, such complaint could fit the frame: "not wholly without merit" and filed in 2017 after the vote was cast in the parliament in March 2017. Very interesting thanks, but I don't see what BB has to do with the UPC. Mr. Hewson, what BB has to do with the UPC is simple. The EPO BoA has a final Appeal instance which will rule on the validity of subject-matter that will eventually be enforceable against people in member states of the UPC. Art. 23 of the EPC effectively requires that the members of the BoA (acting as the final arbiter of validity, from the Point of view of the patentee) should be Independent. Events reported, for example on so many IPkat threads in the past, would arguably leave the reasonable person in some doubt as to whether those BoA members are really Independent. The German Basic Law under Article 97 refers to and provides a guarantee of Judicial Independence in Germany. If a property right granted via the EPO comes into effect in Germany via an administrative process which arguably might not comply with the principle Judicial independence, the BvG might want to take a look at that. Remember that the rules of procedure (130 pages of laws) are not made and approved by parliaments. They are a disgrace to how laws should be made in a democracy. Come on. Neither the EPC nor the PCT could be handled absent easily amendable Rules, and the same holds for the UPC. Especially for a totally new organization it is essential that it is easily possible to adapt the Rules to practical issues that will only appear in practice. Asking 25 national parliaments to approve each and every minor issue will cost a decade per Rule change. The issue in the older case is less a granted patent by the EPO, but a lack of independent courts for applicants whose application got refused. If the BoA/DG3 is not independent, then the applicant who did NOT get a patent got denied his constitutional right to an independent judges review of an administrative decision. We'll see, either solution will not be liked by the EPO management, as their recent "reform" of perceived independence will also be scrutinized by the judges of the federal constitutional court in Germany. German companies and citizens will also have to rely on non-legally binding automated translations from english? Does anyone know how long the Bundesverfassungsgericht will take to provide a ruling in this case? Indeed, is there any possibility for the proceedings to be accelerated, for example in view of the upcoming Brexit deadline? I have not yet seen anyone seriously suggest that the UK can ratify the UPC after Brexit. However, if the BVerG takes as long with this case as is has done with the pending complaints relating to EP patents, then we could end up considering that very question in great detail. So the criticism of the Brits re goatskin is again without foundation. Some countries may not expect to exist in 500 years, so pencil and rice paper will do the job, but Britain does. A few people have asked about timing. From what I gather the Court proceedings have already been expedited, which means a decision in perhaps 6 or 12 months. Still before the date of Brexit but getting uncomfortably close. Acts of Parliament are still printed on vellum (skins of calves) though, even if the goats have been let off.